I made a couple of skirts. One I am very happy with but the other is just ok. Nothing exciting to talk about here in my intro, so on to the review. I'm brain dead at the moment. We are in the last week and half of school and the kids have gone bonkers. Pattern Description: Simplicity 8019, a vintage 70's reprint. The pattern is a front gored, buttoned skirt in four different lengths. 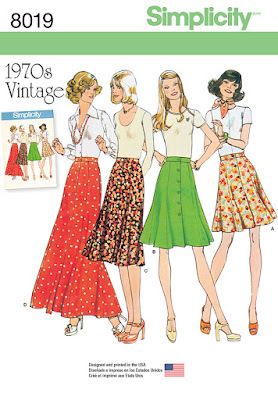 My first version is the turquoise linen skirt. My second, which I am much happier with, is the printed rayon midi length skirt. Pattern Sizing: The pattern offers sizes 6-24. I made kind of a mix of sizes 16-18. I cut the pattern as a size 16 but when I held up the waistband piece, I realized that a size 16 waistband was not going to fit me where I wanted the skirt to sit. This must be designed to sit right on the natural waist. I wanted my skirt to sit lower, so I cut an 18 waistband and then sewed slightly smaller seam allowances at the top of of my skirt pieces so the waistband would fit. I'm not sure that was the best decision as the skirt would probably be a lot more flattering if it sat at my natural waist. I think it messes with the proportion a little bit. I think this is why I don't love the turquoise version. Fabric Used: Turquoise linen/rayon blend for skirt one. Ditsy rayon challis print for skirt two. I think this skirt pattern lends itself to all types of fabric. 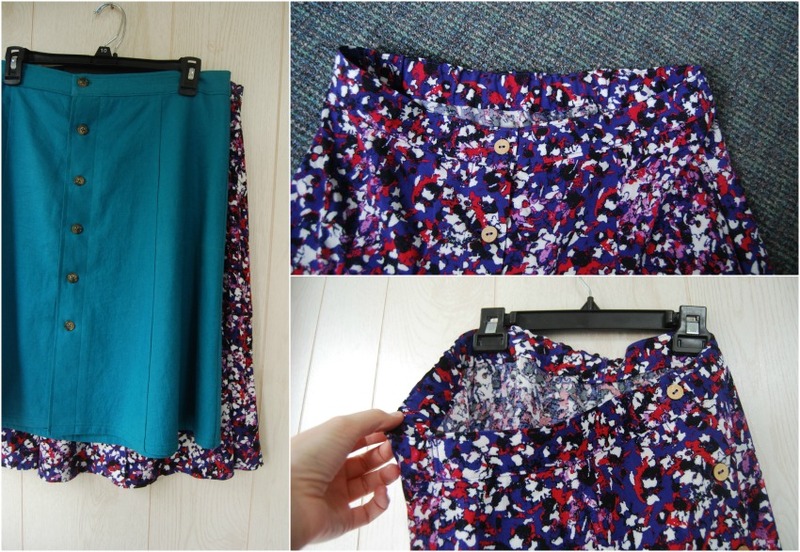 Alterations/Deviations: Other than the waistband issue I mentioned above, I made no other changes to the turquoise skirt. The length is the shortest length offered. Not as short as it looks on the envelope, but remember my skirt sits lower on my waist. 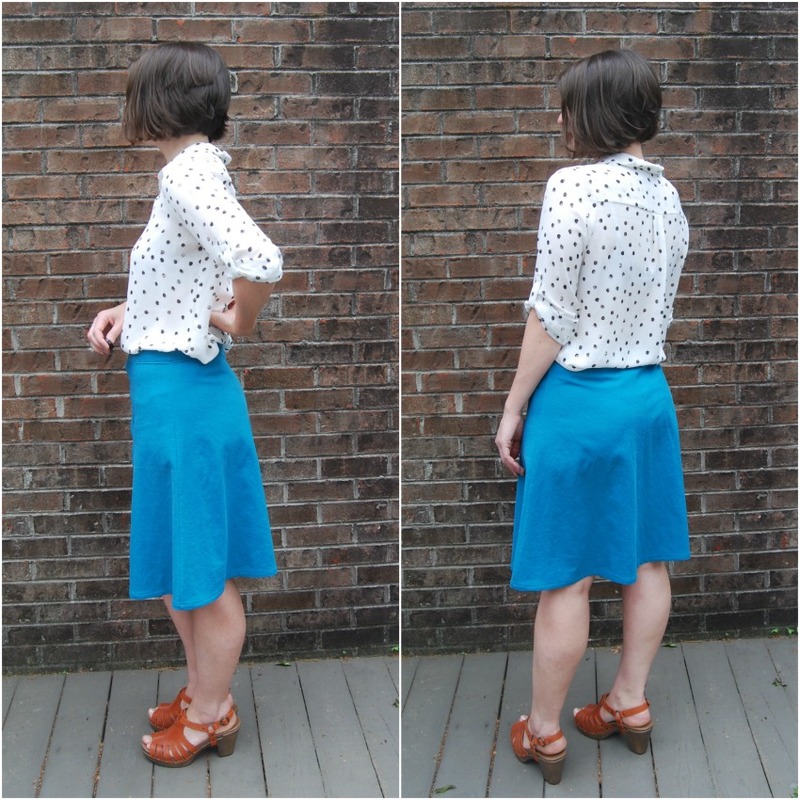 When I made the rayon skirt, I was worried the waistband would be too flimsy (even interfaced). So I added elastic to the back waistband which I am patting myself on the back for. It keeps the skirt sitting where I want it to and takes care of some fit issues I have with the first version. If I make this again, I will definitely do the same thing again. I just sewed the waistband on and inserted elastic in the back half, stitching it at the side seams. I only pulled the elastic slightly. Just enough to give the back waistband a little bit of tension. It's smooth when it's on. The rayon version originally began as a maxi but I think I'm kind of over maxi skirts here lately. I kept shortening it (three times!) until I ended up with a length I liked. Well, I guess I like it. There is something frumpy about it in photos but I think it looks better in real life. It's flips and swishes around when I walk and it's fun to sit and cross your legs in with the button band split at the bottom. It's only a couple of inches longer than the turquoise skirt. It sits just below my knees. Likes/Dislikes: I like the flared shape and button front. I do have some fit issues with the linen version. I think those wrinkles in the back have something to do with sewing the seams with smaller seam allowances. Or I need a sway back adjustment. I also do not like how the front of my linen skirt wrinkles. It's pretty unflattering and makes the button band stick out. I know I have a little belly there but I think the button band sticking out accentuates it even more (see below!). I don't feel that way in the rayon version. Anyway, I'm letting the turquoise skirt sit in the closet for a while to see if I grow to love it later. The rayon one has already been worn multiple times. Conclusion: Nice little skirt pattern. I would like to make it again in a longer midi length (mid calf). I actually have some black tencel fabric that would be perfect. And who couldn't use a good black skirt. I'll add it to the queue! I like both skirts especially the color of the linen one. However, I understand why you prefer the rayon one. Now do you understand why I sew a pattern 4-5 times? You can work out each issue and end up with better garments with multiple sews. 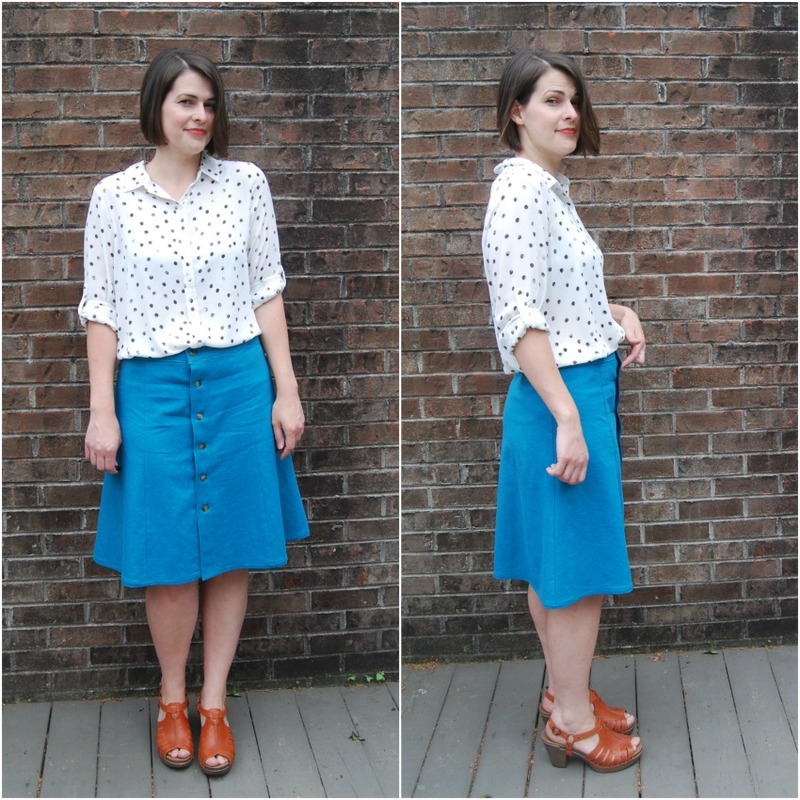 One mor version should make you a great skirt! "We are in the last week and half of school and the kids have gone bonkers." Thanks for this! I have 5 weeks left! I love both skirts. i've had your last dress post open in a tab since you published it, and i forsee the same fate for this skirt post. i love your makes, and i love seeing you pop up in le feed! First of all, I adore that midi length on you, especially with your clogs. It is everything I love about 1970s style, and looks flattering and graceful on you. I really like the turquoise skirt too, because the solid shows off the details of the skirt and it's a beautiful color, but solids also unfortunately show every little issue, am I right? Especially in a crease-y linen. Perhaps in a stretch woven fabric it would be more forgiving? But I am super into this pattern on you! Make more! I actually really like the turquoise skirt. The buttons are more of a feature on this skirt which gives it the retro 70 vibe. I would pair it with a brightly coloured tank top...but not the tank tops of today, more the sort like a camisole with wide straps, and maybe a shirred hem band. That black tencel skirt sounds just perfect! And I love the swish in the rayon floral version!! I think these are both cute! I've had that sticky-out problem with button front skirts before too... very annoying! Maybe a tiny snap in between the waistband and first button would keep it in place? I have to say, I really love that you often make two or more of the same pattern and post them at the same time. Seeing the same pattern side by side in different fabrics or with fitting tweaks gives a very good review of a pattern. Good luck with the last week of school! I think they're both really great, but I kind of like the turquoise one more. Is that crazy? The floral one is pretty too, don't get me wrong, but if they were mine, I could see reaching for the turquoise one more often. I've had that button thing happen to me before, and while I don't know for 100% certain, I think it has to do with the placement of the button and the button hole on the waistband. This happened to me on a pair of jeans, and I moved the button slightly closer to the side seam and it helped. Hope the kids don't drive you too crazy! cute cute!!! I know those kids are annoying...enjoy your summer!